The Healing Touch - The Alleged Healing Effects of Touching Someone "Special"
When someone is credited with supernatural medical abilties, it is often because he occupies some public office which is thought to be endowed with miraculous power. One of the most dramatic examples in the history of medicine is that of the Royal Touch. For more than 700 years, the anointed kings of France and England were regarded by their subjects miraculous physicians whose mere touch would cure physic illness. The patient had only to come into the presence of the king and make contact with his sacred person to be healed. Traditionally, the patients who submitted to this treatment all suffered from the scrofula, a tuberculous inflammation of the lymph glands in the neck. It has never been satisfactorily explained why this particular illness was thought to be susceptible to the Royal Touch, but the association between scrofula and monarchy had become so well-established by the Middle Ages that the illness was known as the “King’s Evil” — as if the sovereign were both cause and cure of the illness. Sufferers ritually assembled in the royal presence, usually in a church, on the occasion of important festivals such as Easter and Ascension. 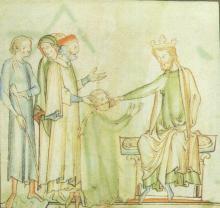 In the Middle Ages these séances became a regular feature of the royal calendar, and from time to time the miraculous credit of the king was so high that it extended to inanimate objects with which his body had been in contact — the sufferers would drink the water in which the miraculous physician had washed his hands. In France the ritual survived until the monarchy was overthrown in 1793: Louis XVI was treating sufferers until a year or two before his execution. The same type of ceremony was inaugurated in England by Henry I, and the ritual did not die out until the accession of the Hanoverians. The association between monarchs and miracles has a long history. Amongst the German tribes of pagan Europe the king or chieftain was widely credited with being able to intervene in the course of nature, to turn aside the threats of flood, famine and pestilence. However, these powers remained vague until the installation of Christian monarchy, and the ceremony of the Royal Touch was not formally inaugurated until European kings were installed by the rite of coronation, which, by re-enacting the baptism of the body, identified the monarch with the supernatural authority of Jesus Christ. Ironically, the rite which helped to confirm the Royal Touch transferred it from the person of the king to the office of monarchy, and his medical power was not allowed to come into play until he had been anointed and crowned. The miracle was automatically transferred from one monarch to the next, and although the mortal remains of the dead king continued to inspire awe and respect, they were, unlike the relics of a saint, medically inert. This distinction is vividly expressed in the funeral effigies which are to be found in the royal mausoleum at St Denis near Paris. The tombs contain not one but two statues of the king: a naked figure representing the mortal remains of the man himself and a gorgeously robed effigy which stands for the imperishable office of the monarchy. Nowadays, we regard the naked statue as a reminder of the fact that even kings must die. But for the men of the Middle Ages the clothed figure made the much more important point that the institution of monarchy was indestructible. When the divinity of the office was called into question, the medical miracle associated with it suffered a severe setback. Although Charles II reinstated the practice following his restoration, the ceremony never fully recovered its former vigour, and by the time Samuel Johnson was brought up to London to receive the touch of Queen Anne, it was little more than a quaint survival. The charismatic hero does not deduce his authority from codes or statues, nor from traditional customs, nor from feudal vows of faith. He gains and maintains his authority by proving his strength in life. And a woman having an issue of blood twelve years, which had spent all her living upon physicians, neither could be healed of any, came behind him, and touched the border of his garment: and immediately her issue of blood stanched. And Jesus said, Who touched me? When all denied, Peter and they that were with him said, Master, the multitude throng thee and press thee, and sayest thou, Who touched me? And Jesus said, Somebody hath touched me: for I perceive that virtue is gone out of me. And when the woman saw that she was not hid, she came trembling, and falling down before him, she declared unto him before all the people for what cause she had touched him, and how she was healed immediately. And he said unto her, Daughter, be of good comfort: Thy faith hath made thee whole; go in peace [Luke VIII, 43-8 (also Matthew 9:20-22)]. The miraculous authority of the prophet Elijah was also personal in character, although the miracles were performed through rather than by him; whereas Jesus Christ, as the incarnation of God and not merely his earthly representative, was presumably the author of his own remedies. In both cases, though, the therapeutic power was invested in the living person of the miracle worker himself. Neither Jesus nor Elijah offered his cures as a routine outpatient service. They used their powers somewhat sparingly, and when they did stoop to heal the sick it was with the ulterior motive of dramatising their mission and making a point about the miraculous power of faith. This is almost the reverse of modern faith-healing, in which the healing is an end in itself. Nowadays faith-healers hold regular clinics, and, although these are usually cast in. the form of religious services, which means that the cures are regarded as sacraments and not simply treatment, the congregation has a particular interest in dramatic clinical improvements. The gift of miraculous healing can just as easily be recognised in someone who claims that and nothing more especially when affliction is widespread and unrelieved. His charisma may, in fact, consist of nothing more dramatic than a convincing account of the moment when he was called to exercise it. Other places in the Bible. Note in many cases there must be confirmed anticipation of being healed by being touched before the miraculous touch can be administered. (Mark 1:40-42 [Matthew 8:2-3] [Luke 5:12-13]) A man with a skin disease came to him and begged him on his knees, "If you are willing, you can make me clean." Filled with compassion, Jesus reached out his hand and touched the man. "I am willing," he said. "Be clean!" Immediately the leprosy left him and he was cured. (Mark 3:10) For he had healed many, so that those with diseases were pushing forward to touch him. (Mark 6:56 [Matthew 14:35-26]) And wherever he went--into villages, towns or countryside--they placed the sick in the marketplaces. They begged him to let them touch even the edge of his cloak, and all who touched him were healed. (Mark 7:32-35) There some people brought to him a man who was deaf and could hardly talk, and they begged him to place his hand on the man. After he took him aside, away from the crowd, Jesus put his fingers into the man's ears. Then he spit and touched the man's tongue. He looked up to heaven and with a deep sigh said to him, "Ephphatha!" (which means, "Be opened!"). At this, the man's ears were opened, his tongue was loosened and he began to speak plainly. (Mark 8:22-25) They came to Bethsaida, and some people brought a blind man and begged Jesus to touch him. He took the blind man by the hand and led him outside the village. When he had spit on the man's eyes and put his hands on him, Jesus asked, "Do you see anything?" He looked up and said, "I see people; they look like trees walking around." Once more Jesus put his hands on the man's eyes. Then his eyes were opened, his sight was restored, and he saw everything clearly. (Matthew 8:2-3 [Luke 5:12-13]) A man with a skin disease came and knelt before him and said, "Lord, if you are willing, you can make me clean." Jesus reached out his hand and touched the man. "I am willing," he said. "Be clean!" Immediately he was cured of his skin disease. (Matthew 8:14-15) When Jesus came into Peter's house, he saw Peter's mother-in-law lying in bed with a fever. He touched her hand and the fever left her, and she got up and began to wait on him. (Matthew 9:28-30) When he had gone indoors, the blind men came to him, and he asked them, "Do you believe that I am able to do this?" "Yes, Lord," they replied. Then he touched their eyes and said, "According to your faith will it be done to you"; and their sight was restored. (Matthew 20:30-34) Two blind men were sitting by the roadside, and when they heard that Jesus was going by, they shouted, "Lord, Son of David, have mercy on us!" The crowd rebuked them and told them to be quiet, but they shouted all the louder, "Lord, Son of David, have mercy on us!" Jesus stopped and called them. "What do you want me to do for you?" he asked. "Lord," they answered, "we want our sight." Jesus had compassion on them and touched their eyes. Immediately they received their sight and followed him. (Luke 6:18-19) Those troubled by unclean spirits were cured, and the people all tried to touch him, because power was coming from him and healing them all. (Luke 7:12-15) As he approached the town gate, a dead person was being carried out--the only son of his mother, and she was a widow. And a large crowd from the town was with her. When the Lord saw her, his heart went out to her and he said, "Don't cry." Then he went up and touched the coffin, and those carrying it stood still. He said, "Young man, I say to you, get up!" The dead man sat up and began to talk, and Jesus gave him back to his mother. (Luke 18:15) People were also bringing babies to Jesus to have him touch them. (Luke 22:50-51) And one of them struck the servant of the high priest, cutting off his right ear. But Jesus answered, "No more of this!" And he touched the man's ear and healed him.